Ba’adra camp. Photo by John Murphy. When I arrived in my first base of operations the first thing I experienced was the gut wrenching sink in the stomach of seeing one of the NGO camps from a distance. On a hill above the town, it sits there like a child on the back of a mother. And so it is: this is one of the lucky camps that was placed next to a village that mothers and supports it. Isiya camp is located about a five-minute walk from Ba’adra. The village and the nearby camp have developed a symbiosis. From cut-rate heaters to an office supply store that offers laminating services for refugees’ ID cards, the community does the work necessary to keep the refugees alive. The camp, however, is three times the size of the town, and the strain on the town’s infrastructure is apparent. I arrive from the city of Dahouk. Below me I look out to see a rapid succession of sights. My heart flutters upon seein the fluted spires of a yezidi quppa at the base of a hill and my interest is piqued as I see a gathering of Yezidi men at the base. The heaviness settles over me like a heavy shroud as the immensity of the camp fills my vision. 20,000 plus people, subsisting, with only food and water. Lives in pause. My friend Thammir, who is a relative of Salem, stands looking out at the gathering below. Salem himself comes up and explains that this gathering is a funeral for his mother-in-law. I do what instinctively comes first: I place my hands on his shoulder and say that I am sorry. Tammir shrugs somewhat helplessly and gestures up across the valley to the vast expanse of white tents, each one a tragedy. No words can convey that; tears cannot even flow. It just constellates on the heart. This is a deep-cutting pain for the Yezidi. In his book The Leopard’s Tale, Ian Hodder talks about the ancient Anatolian cultures as not having a sense of the nuclear self. And I begin to see this with the Yezidi: the sense that all are connected. There is no compartmentalization with these families, or with these individuals. What happened in Sinjar happened to all of them. With this knowledge I make my first trek to the campus to record the stories of the refugees who have been in their first full season of exodus. Salem and Ali sit on either flank of John Murphy. My guide Salem, who has been working to help his people for months, knows right where to take me: through the camp, past four trucks surrounded by people, past faces lost in the ocean of tents, right to its heart. We come to what looked like another wave in an ocean of white. To the front of the tent we come and the door opens to reveal a family of eight living in close quarters. A middle-aged man with a tired expression smiles to me and welcomes us in. 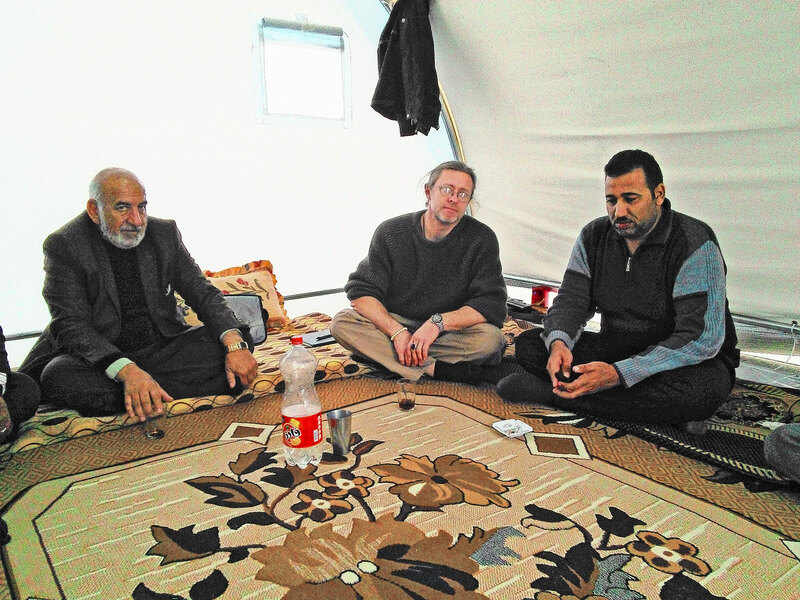 A unique experience begins today: my initiation to the bottomless hospitality of the Yezidi. Entering the tent the stark nature and sterile environment makes me feel as if I am in a bio-containment facility. Only the modest carpet and the patterned doshek, which serve as sitting pads and bedding, fills the room with any delicacy. The floor is like a Bedouin tent, the ceiling like an X-Files set. Upon entering I am ushered to the most comfortable place in the tent and Ali sits down next to me, with Salem to the other side. A few years ago there would have been a shore of class structure, but now one can see the breakdown of roles. 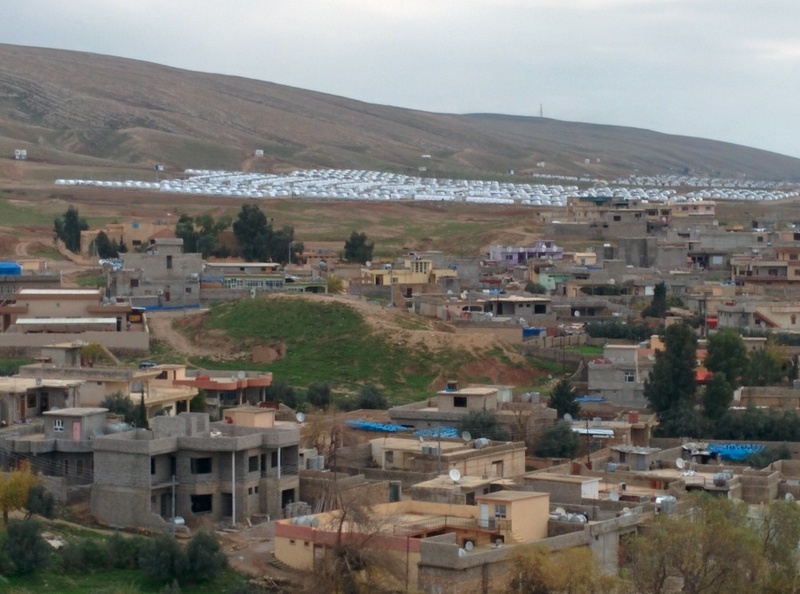 Yezidi are still divided in structure, but the divisions are becoming more and more blurred. Salem, although a high ranking sheikh, demonstrates the new way, looking to those Murid in sufferance with respect and caring: a fellow human with equal rights. You can not escape the çai, and on cue I am served by refugees with sparkling eyes. It is a joy for them to offer hospitality to a guest. For them, the presence of a guest is a part of the healing. They are people who come in and care for others in a world that has gone stark raving insane. I am there for a purpose. I am hunting, in part for a story and in part for people who can come to the West with me to tell the story first-hand. Sitting next to Ali, we begin the long process of interviewing and talking. The translation is a challenge. I want to get this on video, but the process is a back-and-forth that I know will drive the video editor crazy. Step by step. Inching. We move forward. As I learned earlier, Ali was a police officer in Singal who faced the first wave of attacks. That he moved to escape made all the sense in the world to me. Singal didn’t have a chance. The Chinese AK sitting behind us in the corner would serve no use against an Abrams tank. More than a few of my friends have told me about how the shells from their RPGs would skitter off the armor and explode in the distance. America has made some effective armaments–for whomever it is that uses them. The sorrow and feelings of failure are apparent in Ali’s face as he recalls how he grabbed his family and joined the exodus, confused why there was no support for them. Along with the others in the town they evaded the terrorists penetrating the town and headed north to the traditional hiding places on the Sinjar mountain complex. Behind them they were pursued by the Islamic State and the mountain was surrounded, turned into a trap. The Yezidi were not used to heavy armor that could travel at 100 kph, and were caught off guard. The story continues with the seven days on the mountain. No food, no water, in summer heat. All had left without their papers and belongings; many had left in only their night clothes and without shoes. Starving to death, dying from exposure and subjected to regular shelling, it was simply attrition. The Islamic State laid siege to the mountain and began to wear down the trapped civilians. While the West sent emails to their constituents blandly responding how “the Iraqi people must solve their problems themselves” (Maria Cantwell’s response to my own pleas), not all were so oblivious to the reality. A little known group of freedom fighters branded by the USA as terrorists for resisting the regime took note. And in the most heroic battle of this time, this band of guerilla fighters pierced a hole in the siege. To everyone’s luck, someone in the USA made a decision to step outside of politics and our support of the YPG began. We still were not talking about it, but the planes finally came in and probably saved thousands of YPG fighters, who were in a do-or-die battle to rescue the hundred thousand plus women and children on the mountain. Like every other person in this camp, Ali recalls the desperate exodus as the YPG and PKK came with cars and trucks, and other Yezidi who had escaped joined in. Where there were no longer trucks, militia and volunteers put women and children on their backs. Soon Ali found himself with the mass that was stuck in Dahouk. The next months were a desperate struggle to survive amidst the ever-growing fear that the Islamic State was going to shell Dahouk as they had begun to shell Erbil. For them it would be the end, all hope would be lost. When I met Ali we had just begun to clear the town of Sinjar. There was a mixed sigh of relief tied to the inevitable sense of loss. The news was returning and to no one’s surprise, reports of houses ruined by fire, explosives and vandalism make them realize the only shelter they will have this winter is the already molding tent that holds his family of eight-plus people. It’s now four months later as he tells his story. We talk and I feel the sentiment, the sheer terror of the Sunni community. I listen with the removed sense of the Western mind, holding my judgment in check. It’s hard to bear. Up till now, the Yezidi town had been only Yezidi but over the past three years the Sunni community had come in a steady flow, buying houses and opening businesses. For Ali and many others after him, it was someone they had known for years shooting at them, hindering them, committing some act of violence or other. It was heart-wrenching for them, and to watch. This first interview sets the template. For weeks after, everything simply grows as a constellation of the original tale. I travel through the camps meeting scores and scores of broken-hearted individuals who look to me for help and desperately search for me to tell me, “I have a very important story for you.” At times it brings me to the thought that I should make a mosaic of all their voices in perfect synchrony, telling their tales in a harmonious chorus. Before I had left, a congressional aide had suggested that I find persons to bring to Congress for testimony. Now here I am confronted by hundreds, thousands of voices, all telling exactly the same tale: isolation, abandonment, betrayal and, very obviously, genocide. Every person I meet has an album of pictures and a list of names. Yezidi have large families who stick together in ways few of us in the West ever experience. The family tree is important for them. I do not know a Yezidi in the six weeks I have been here who has not lost multiple family members. Their losses are vastly underestimated, in part because of the abruptness of their flight, and in part because we in the West are incapable of confronting its vastness. The effects are staggering, humbling, unimaginable to a singular sentience. But it is not just the scale of the loss that awes me, it is also the terror and trauma of the events. I think about another time. A dear friend is sitting with me in a coffee shop as I record her account of the flight. Her story is visceral, terrifying. We both have to stop many times over the three-hour dialogue, but one moment stands clear: the phone call. The phone call–I can’t write those words without my eyes blurring with tears. This phone call she relates to me is unlike anything I have ever heard. Having escaped from her homeland, family terrified, broken and shocked, her friend, a Sunni Muslim, calls her. She tells her of the Yezidi dying in the streets, giving graphic descriptions of friends and family. And then, her friend–one of her closest friends whom she has known for years–orders her to come back. As a Yezidi, she can hardly say no. The terrifying monstrosity of this story shows how the fifth column of the Islamic State very clearly worked its way into the Yezidi communities over many years, earning the trust of the traditionally closed society, observing their ways, learning how to push their buttons. The Yezidi are, as I have said many times before, a gentle, caring, quiet people. They have an inspired side, but for the most part they are a quiet pastoral community with a very humble faith in an ever watchful avatar. I hope in my journey I can extricate the cause of “the phone call.” Was this girl a sleeper agent in the fifth column? Was she herself a victim of mob psychology? Is this a cultural effect that we can not begin to understand? What was this, and why did it happen? How can such horrors occur and friendships turn into cries for a victim to return home to a certain slaughter? There is a deeper story here, great and terrible–a horror of epic proportions. I have no doubts that this will be declared finally a genocide, but I have a greater fear concerning the West’s response. The contrast of my experiences here and the reflection of the Western media’s middling responses has made me begin to suspect the direst calls for the suppression of this story. While we think constantly of the economic disparity growing in the world, we are ignoring the increase in a disparity in basic safety in minority communities. This can only be a spiral that will whirl ever further out of our control. There is a scene in Neil Bloomkamp’s humanocentric movie Elysium in which humans take control over the robotic army of an orbiting space colony. One person sends a fleet of medical aid down to the ailing earth population. Back here on Earth, this will never happen so long as there is no central control program that can redirect our resources to the unimaginable wave of humanity in need. Each one of us, therefore, is on a moving platform, looking out at the world and having to decide: Will we allow “the story” to continue, or will we choose to be part of the very difficult solution, to go forth in the world, and meet the ugliness that is rising in this new millennium head on? As I move north and west from Shariya to my next stop, that dilemma remains. The haunting experiences from my first few days of meeting with the victims will haunt my every footstep on this journey.